The Argentine accelerator NXTPLabs organized its first Demo Day in Buenos Aires last week, with 100 investors, mentors and entrepreneurs in attendance. The event was a showcase of the accelerator’s first graduating class of 15 startups, selected from 150 applications. This first group is only a start: NXTPLabs plans to accelerate two classes each year. It is currently open to applications for its next batch, which will work out of the accelerator’s offices in Buenos Aires’ neighborhood of Palermo. Its focus? “Internet and media companies which have passed their beta stage and are ready to develop the market adoption phase of their business’ growth,” it says. By participating in the program, these startups will get access to seed funding, but also to NXTPLabs’ mentors – it is the only Latin American accelerator to be part of TechStars’ international network. Mentors for its inaugural class included successful Argentine entrepreneurs such as Alec Oxenford and Wences Casares (see our previous post). I was the first one to pitch, which of course added some tension, but I had rehearsed a lot. I could also count on NXTP’s staff and our mentors, and it all went very well. Our mentor Mariano Suarez-Battan also announced he would be the lead investor in our startup, which he has been following since our start in May. When we first met him, we were working on a different idea, but he gave us constructive feedback and we pivoted – so he saw us go from the idea stage to creating a company which provides a solution to a problem. We are currently working on raising US$500,000. Besides angels, we hope to get support from an international fund, which would be our first step towards international expansion, starting with Brazil. 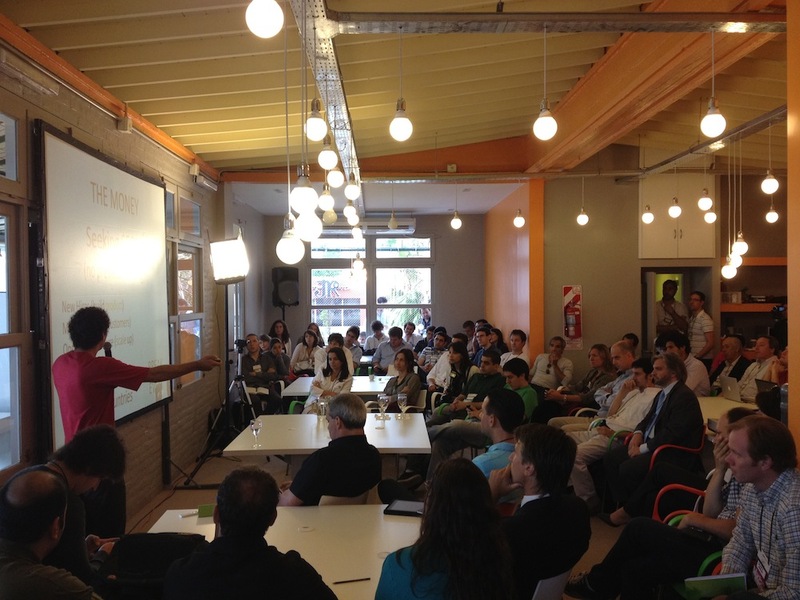 Following Demo Day, we got two meetings with local representatives of foreign VC funds in Argentina. This happened thanks to the event; I had briefly met these persons during a rehearsal pitch, but it’s only after Demo Day that we obtained face-to-face meetings. Afluenta develops financial products supported by disruptive technology platforms through the Internet that promote social networking to facilitate greater access to credit and fairer compensation to capital. Bixti offers e-commerce solutions for designers and handcraft artisans in Latin America and Spain. In a very short time it has already managed to represent 3,000 designers. Comenta.tv is an Argentine start-up selected by Start-Up Chile (see our previous story about Comenta.tv). It is a web platform that aggregates and organizes in real time all comments made on social networks around live Argentine TV programs, thanks to a proprietary and tailored algorithm. Empreware helps people to create business plans and execute them. It offers a business planning online application to over 128,000 users around the world. Fanwards is a social loyalty and rewards platform which engages fans through game dynamics , bringing together the online and the offline worlds. Fanwards provides brands the ability to get better readings on social campaigns ROI. GroovinAds is a platform that combines a decision engine, an ad creation interface and an ad-server (see our post about Red Innova Startup Competition). These give their clients the possibility of running intelligent dynamic ads on any network. During his trip to Argentina, Internet creator Vint Cerf said: “Business models like GroovinAds are great and pay my salary”, so here is a company to watch. Idea.me is a crowd-funding online platform that helps creators from Latin America to find funding for their projects. Inbed.me is a social booking site for travelers (see our story). InBed.me incorporates a social feature that provides an opportunity for travelers to see who will be visiting the same destination at the same time. This company was also selected by Start-Up Chile. Kiuar offers safe check-in technologies with encrypted QR codes to help brands and advertisers identify customer behavior and build custom marketing solutions. Oony is a coupons aggregator that compiles the information of more than 250 sources in 7 countries: Argentina, Brazil, Mexico, Colombia, Chile, USA and Spain. It has iPhone, Android and HTML5 apps and currently reaches 100,000 users, a number which is growing by 7% monthly. The Fan Machine lets its users run promotions and competitions on Facebook (see our previous post). It was launched by the Argentine startup Altodot, selected as one of Facebook’s Preferred Developer Consultants in May 2011. The platform is currently available in Spanish, Portuguese and English. The Social Radio converts your social stream into human-friendly audio and will make it accessible from any device – it recently published an Android app (see our review). You can listen to your Twitter timeline, lists, trending topics, funny hashtags and searches. It is also one of the Argentine start-ups selected by Start-Up Chile. Tienda Nube is an e-commerce platform where retailers and small merchants from Latin America can create their own online web and Facebook store in a couple of minutes. Merchants can give their online stores a customized look and feel and set up multiple storefronts. In addition, it provides e-commerce training. Trendsetters is a private online shopping community for fashion brands and innovative design copyright. The project leverages on two axes: to liquidate inventory of major brands with discounts up to 70% off and to reach more users of design copyright in different locations. The business is currently focused on outfits and accessories, and the startup plans to grow beyond this niche in Latin America. This company will also participate in Start-Up Chile. YoQueVos is an online fashion site that brings the latest in fashion, beauty, events, art, design, and dining tips via email to professional women living in Buenos Aires and Sao Paulo. Have you attended NXTPLabs’ Demo Day? Let us know in the comments.